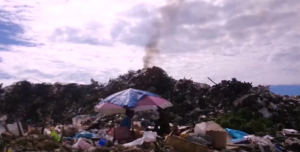 Upon checking, the Department of Environment in Johor confirmed that there had been a fire at a landfill in Bandar Tenggara, southeastern Johor. 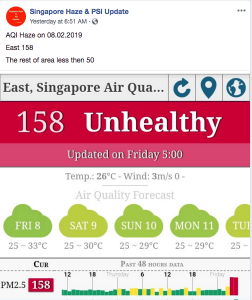 Reports on a burning smell in the air were received since early Friday morning, affecting several parts of eastern Singapore, including Tampines, Bedok and Pasir Ris. There were speculations whether it was coming from other countries. It did not detect “any local sources of burning or factory upsets” that could have caused the smell, NEA said. The environment authority also noted that no transboundary haze was detected in the region either. On Friday, a Band II (Elevated), with 70 to 73µg/m3, for air quality was recorded during the hourly PM2.5 readings from 4 am to 5 am in the east. The rest of Singapore had a Band 1 (Normal) reading. It was only at 11 am that a Band I (Normal) air quality in the east was observed. 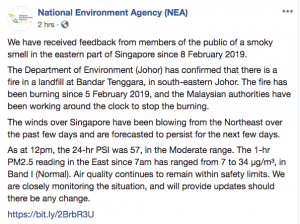 “We are closely monitoring the air quality and will provide updates of any further findings or significant change to the air quality situation,” NEA said on Friday afternoon. However, authorities received reports that the smell had apparently returned on Friday night, affecting people between 10 pm and 3 am. “The winds over Singapore have been blowing from the northeast over the past few days and are forecasted to persist for the next few days,” NEA announced. On Saturday, since 7 am the level was in Band I (Normal) air quality. NEA said levels of volatile organic compounds in the air continued to remain within safe limits. Social media overflowed with posts regarding the burning smell they have experienced. Some people said that this affected them physically as the smell was really bad. 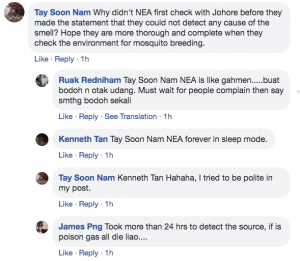 With the pungent air pollution that confronted eastern Singapore, some netizens took this against NEA and the agency’s way to address this kind of situation. Meanwhile, some members of the online public criticized Malaysia for what had happened. Neighboring countries were badly affected by the pollution, and many remarked that this was not the first time, though.